A box of good, all-butter puff pastry in the freezer is like money in the bank at the holidays—just thaw, roll around something savory (or even a whole wheel of cheese!) and bake—it’ll be the star of your hors d’oeuvres table. Want to make it even easier? Pack your freezer in advance with prepared puff pastry bites to bake off at a moment’s notice when friends and family drop by. If you’re feeling motivated, try one of the many “rough-puff” recipes on the internet to make your own pastry from scratch—I assure you it doesn’t take long, isn’t very hard and will be far better than even the most expensive one in your grocer’s case. I’m particularly fond of Nick Malgieri and Martha Stewart’s version (there’s even a video!) which I make with golden yellow pastured butter. Below are three puff pastry hors d’oeuvres listed in order from “really easy” to “slightly more difficult,” but each can be made in advance and frozen, so all you have to do before your party is preheat the oven, brush with an egg wash and bake. Serve hot or at room temperature. Savory and umami-rich, these palmiers are a hit at my holiday gatherings. A blend of interesting local mushrooms give the most flavor, but just plain white buttons will do in a pinch. Just be sure to really cook the liquid out of the minced mushrooms before seasoning with salt to achieve a nice, dry filling. Avoid Portobello mushrooms; their black gills will make sludgy pastries. And if you have anything truffle-y lying around (paste, sauce, salt—just not faux truffle oil, please! ), here’s the recipe to use it in for an extra special treat. Pulse mushrooms in a food processor until finely minced. Sauté shallot in butter and 2 tablespoons olive oil, then add the mushrooms and thyme. Cook, stirring, until the mushrooms release their liquid and reabsorb it. Season with salt and pepper to taste, stir in crème fraîche and set aside to cool; chill in the fridge until very cold. Roll out a puff pastry sheet to a 10- by 12-inch rectangle, then spread the chilled filling all over. Fold the bottom edge up to the middle and the top edge down to meet it, then fold top over bottom again to make a rectangle. Slice crosswise into ½-inch slices. Arrange the palmiers cut side up on parchment-lined baking sheets, brush with egg wash and bake 15–20 minutes, or until puffed and golden. Alternatively, freeze unbaked palmiers until solid, then store in zip-top bags until ready to bake (they take 20–25 minutes from frozen). 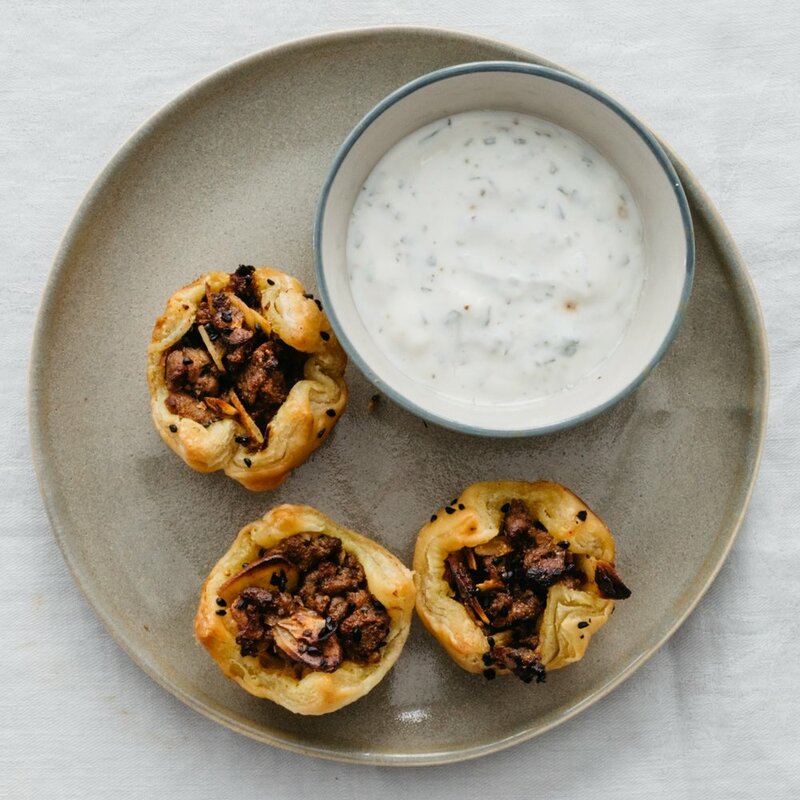 Using a mini-muffin tin as a mold, these little pastry cups hold a savory blend of minced lamb and sliced almonds, topped with nigella seeds and feta cheese, if you like. Make this a more substantial dish by folding the lamb mix into big pastry triangles, crimping the edges to seal; one or two served with a salad makes a nice lunch. The bright, sour yogurt-mint dipping sauce cools the chili heat of the lamb and contrasts nicely with the warm, flaky pastry. Sauté onion and garlic in 2 tablespoons olive oil. Add ground lamb, cumin, curry powder, chili flakes and salt and pepper to taste. Sizzle in the pan, breaking up lamb with a spatula, until browned and crispy all over. Stir in fig jam or chutney, lemon zest and juice, cilantro and sliced almonds. Add a few tablespoons water to deglaze the pan. Chill until very cold. Roll out a puff pastry sheet to a 12- by 12-inch square and, using a ruler or straight edge, cut into 36 (2-inch) squares. Tuck each square into the cup of a mini muffin tin, then fill with a tablespoon or so of lamb-almond mixture. Crumble in some feta, if you like. To make in advance, wrap muffin tin(s) with plastic and freeze until firm. When ready to bake, brush edges with egg wash and sprinkle with nigella seeds. Bake at 400°F for 15 minutes, or until browned and sizzling. While they bake, stir together yogurt, mint, garlic, lemon juice and sea salt to taste. Serve puffs hot with sauce for dunking.